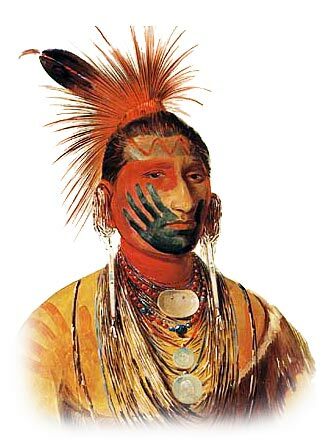 Facts and information about the History of Clothing and regalia of Native American Indians and their Jewelry. Authentic Native American Jewelry made by the indigenous Indian tribes included items of personal adornment such as necklaces, pendants, bracelets, rings, armbands, earrings, chokers and breastplates. Native American Jewelry was originally made from the natural resources available according to the location of different tribes or through trade. Jewelry and beads were made from a variety of materials including the claws, bones and teeth of animals, stones, ivory, hide, vegetable fibres, woods, shells, quills, precious and semi-precious gemstones such as turquoise and various metals including copper, gold and silver. The history of traditional or ceremonial dress and regalia worn by diferent is a fascinating subject. The following fact sheet contains interesting facts, history and information on Native American Jewelry. Examples of the many different types of authentic Native American Jewelry for both men and women can be seen via Native American Pictures.